11:01 — Vin Scully! “And a pleasant good day to you wherever you may be.” Now it really is baseball season. 11:13 — Hey, a new family movie starring Ice Cube! Looks about as good as the Devil Rays. 11:15 — There sure are a lot of car commercials on YES. But I thought no one in New York drove. 11:19 — The Blue Jays caps have a “T” instead of a “J,” I notice. Too bad, because I liked the “J.” Maybe that’s still the home cap. 11:21 — Two female fans in the upper deck of Comerica Park are interviewed. One of them refers to it as “Tiger Stadium” and is quickly corrected by the interviewer. 11:24 — Since the Reds are wearing their new mustachioed Mr. Redlegs patches, perhaps they should all have grown mustaches to match. 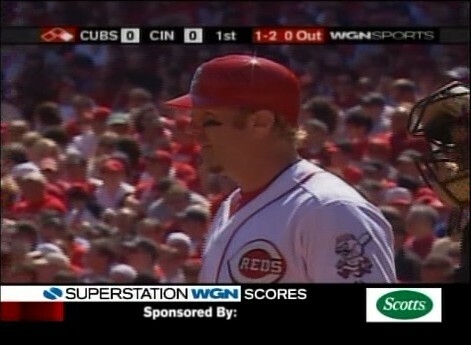 11:25 — The Superstation WGN Scoreboard graphic has a problem, I say. I contend that “Sponsored By:” should either be right-justified so it’s against the sponsor graphic, or that graphic should say “Sponsored by Scotts” (which would work fine even with the graphic there on the right). 11:29 — C.C. Sabathia looks a little large. 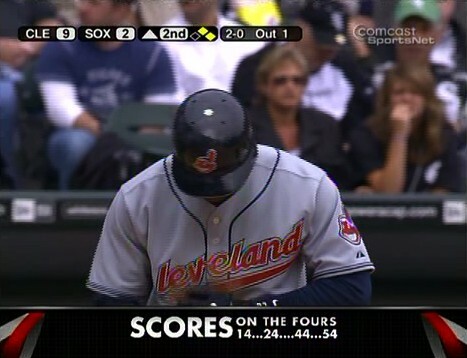 11:31 — The White Sox announcers start talking about how one should not judge a book by its cover when it comes to C.C. Sabathia. I guess I’ve been properly chastised! However, Darin Erstad promptly hit a 2-run homer off him to pull the White Sox to within 3 runs in the bottom of the 1st. 11:37 — Chicago mayor Richard M. Daley is in the stands at U.S. Cellular Field, but does not have to be interviewed by someone with a radio mike. 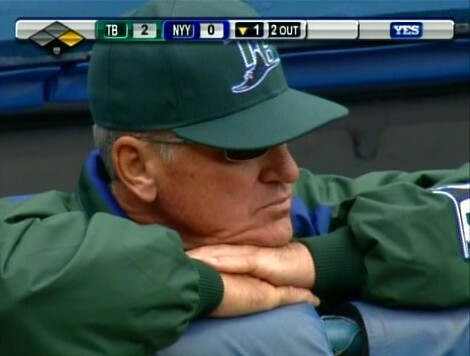 11:39 — The Yankees infield has been a bit error-prone today, which has helped the Devil Rays tie. 11:40 — First appearance of Joe Maddon, coming out for an explanation from the umpire about a player being called out on a bunt that hits him in fair territory. 11:42 — Rocco Baldelli hits an RBI single, and the Devil Rays are leading. 11:44 — Amtrak — the Washington Nationals of transportation! 11:49 — Hey, Dr. Cox from “Scrubs” is in that movie with Ice Cube. Well, John C. McGinley, I mean. I assume he’s not playing the same character he plays on “Scrubs.” Not to be confused with John C. Reilly, who is not to be confused with Andy Richter, who is not to be confused with John Candy. All good baseballrelated.com readers (and writers) are going to mlb.com and casting their ballots for Carl Crawford of the Devil Rays in the last roster spot in the All-Star Game, yes? Sure, he’s no Rocco Baldelli, but then, who is? In other news, it seems the comments aren’t working again, thus making me look like an idiot after I made that post a few days ago. I may have to invoke the nuclear option — actually, it’ll be more of a smart bomb — this weekend. I’m leaving for New York early Tuesday morning, and probably won’t have computer access until I get back late Sunday. I intend to go to the Yankees-Devil Rays game Thursday night, but may be going solo because certain people have to work, or so they claim. Perhaps while I’m gone, everyone can complain about the All-Star Game selections. Where’s Victor Zambrano and his awesome June?! Where’s Maura’s favorite player?! Why can’t I do a write-in on this “final vote” thing? !